Elghobashi, S., ほか3名, “Prediction of the particle-laden jet with a two-equation turbulence model,” Int. J. Multiphase Flow 10-6(1984), 697. 湯晋一・ほか2名, “三次元固気混相乱流自由噴流のTwo-Way Methodを用いた直接数値計算と実験による検証,” 日本機械学会論文集 60-572 B(1994), 1152. 湯晋一・ほか2名, “高レイノルズ数スリットノズル固気混相噴流の流れに与える粒子の影響,” 日本機械学会論文集 66-641 B(2000), 57. 内山知実・ほか2名, “渦法による固気二相自由乱流の数値解法（数値モデルと二次元混合層への適用）,” 日本機械学会論文集 66-651 B(2000), 2853. Uchiyama, T. and Naruse, M., “Numerical simulation of gas-particle two-phase mixing layer by vortex method,” Powder Technol. 125(2002), 111. 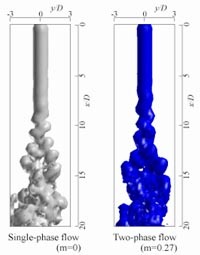 Uchiyama, T. and Naruse, M., “Vortex simulation of slit nozzle gas-particle two-phase jet,” Powder Technol. 131(2003), 156. Uchiyama, T. and Yagami, H., “Numerical simulation of wake gas flow laden with solid particles,” Proc. 2nd Asian Particle Technol. Symp., Penang, (2003), (on CD-ROM). 内山知実・北野佳伸, “自由落下粒子群が形成する粒子噴流の数値解析,” 日本機械学会論文集 69-684 B(2003),（印刷中）. Uchiyama, T. and Fukase, A., “ Three-dimensional vortex simulation for gas-particle two-phase compound round jet,” Proc. 2nd Asian Particle Technol. Symp., Penang, (2003), (on CD-ROM). 菱田公一・ほか2名, “固気二相軸対称噴流の乱れ構造,” 日本機械学会論文集 51-467 B(1985), 2330. 内山知実・成瀬正章, “Vortex in Cell法による固気二相自由乱流の数値解析（数値解法と二次元混合層への適用）,” 日本機械学会論文集 B(2003), （印刷中）.